Wadi Ram and its mountains: "the vertical desert"
Crossing the desert, on the road which joins Aqaba and Amman, going eastwards, wonderful coloured peaks can be seen: the Jebel Ram 1754 mt. The pink desert of Wadi Ram the local Bedouin tribe of Howeitat, the "vertical desert" and its roads, the real "adventurous land" for expert climbers all remind us of Lawrence of Arabia and his bellicose adventures. The climb isn't extreme, but due to the kind of rock which holds pitons only when expertly planted, good experience is required. 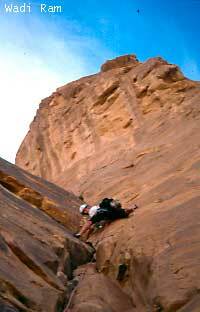 It is a trip in our classical mountaineering of the past, in an attractive and fantastic land. Duration: 7 days minimum, 10 days are suggested. Participants: 2 or more if able to climb roped together and with the help of a guide.